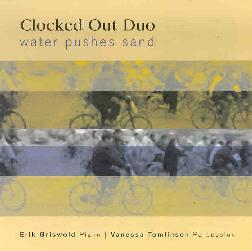 Clocked Out Duo - "Water Pushes Sand" / Erik Griswold - "More Than My Old Piano"
Clocked Out Duo is the Australian combo of Erik Griswold on prepared piano and Vanessa Tomlinson on percussion. The duo traveled to China and apparently spent some time studying there, and the music on Water Pushes Sand reflects their interest in Chinese percussion music, street sounds, prepared piano and toy instruments. The CD opens with the title track, "Water Pushes Sand". The liner notes tell us that the music uses traditional rhythms from the "Wen Chang" style of Sichuan Opera percussion that the duo learned in China from Master Zhong Kai Zhi, though Griswold and Tomlinson incorporate western sounds and improvisational ideas. The music is dark and pounding but with a sense of playfulness. Griswold reminds me of the early Present pianist Alain Rochette, and combined with Tomlinson's intricate percussion patterns the result is a very full sound (excellent recording quality) that makes me feel like I'm in a concert hall. On "Bicycle Groove" both piano and percussion have a powerful melodic quality, with the Chinese influences apparent but also with a jazz feel. The bicycle bells are a nice touch and fit the music perfectly. "We Move By Intuition" is equally melodic, even serene at times, and beautifully composed with gorgeous piano and percussion work that recalls the title track. "Dear Judy" starts to explore sounds creation, featuring killer intense piano work from Griswold combined with scratching sounds that must be from Tomlinson though I can't tell how they were created. I smiled when I read that the track is a homage to balloonist Judy Dunaway because if you rubbed your palms frantically over a balloon you would produce a scratching sound exactly like that heard in the music (maybe that's how it was done?). "Motorcycling Through The City Of Churches" and "Waltz" are quieter pieces that put even more focus on sound creation. "Felaminikuti" is a quietly busy tune that uses toy piano and all manner of strange sounds (do I hear a rubber ducky?) to interesting effect. "Delicious Ironies (Sichuan)" is a similarly fun track that sounds like a chaotic concert hall video game. The piano keeps the pace with a sometimes dissonant piano that alternates between peaceful and frantic. The percussion and oddball sounds providing the color, character and avant-garde elements, making for an atmosphere of intensity and fun. I'm not sure but it sounds like the album consists of a combination of improvisation and composition, though everything has a controlled and composed feel. 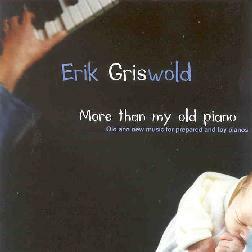 It's clear from the music on Water Pushes Sand that Erik Griswold is a gifted and expressive pianist so I was eager to move on to his solo album, More Than My Old Piano: Old And New Music For Prepared And Toy Pianos. Griswold continues to explore his passion for Chinese music, adding his interest in Latin music to the mix, plus regaling us with his interpretation of some old jazz, Motown, and country songs. There's also a little piece of paper stuck in the jewel case noting that all the tracks were recorded live with no overdubs so this must be a message Griswold felt important but left out of the liner notes. The opening track, "Guaguanco", is an interesting tune. In less than 4 minutes Griswold manages to blend Chinese influences and jazz, and even creates patterns with the piano that remind me of the sort of old German school of electronics that Tangerine Dream and the like created (unintended I'm sure). So it was even more interesting to read in the liner notes that the music is informed by Cuban musician Carlos Embale. The Latin jazz influences, specifically Brazilian, are more apparent on "Batucada". The CD also includes three traditional Sichuan folk songs: "Bitter Vegetables, Bitter Yinyan", "Kang Ding Love Song", and "Little Sister Love A Hard Working Man". Bitter Vegetables has a bit of a jazzy feel along with the Chinese influences. And I'm sure I've heard the melody from "Kang Ding Love Song", or something very close to it, in dozens of movies. Griswold excels at seamlessly blending varied influences and the results are always intriguing. "The Gris Is Getting His" is another standout track, being a cool rolling jazzy tune that utilizes standard and toy pianos. I really dig this tune as it reminds me a lot of Rotcod Zzaj's keyboard grooves and style. Finally, we're treated to beautiful renditions of Duke Ellington's "Solitude", Stevie Wonder's "Don't You Worry ‘Bout A Thing", Al Green's "Tired Of Being Alone", and Merle Haggard's "More Than My Old Guitar". In summary, there lots here for both free-improv and general avant-garde fans to enjoy. Griswold and Tomlinson are accomplished and creative musicians, making music that is adventurous and exciting, but always accessible. I also like the detailed information in the liner notes of both CD's, explaining the artists' influences for the projects and even giving detailed track information. For more information you can visit the Clocked Out Productions web site at: http://www.clockedoutproductions.com. Contact via snail mail c/o Clocked Out Productions; 38 Gray Road; Hill End; QLD 4101; Australia.